South Carolina became a state May 23, 1788, the 8th state admitted to the Union. As one of the Thirteen Colonies, South Carolina was the first to declare independence from the British Crown (March 26, 1776) when it adopted the “Constitution of South Carolina” and became the first republic in America. It was also the first to ratify the initial governing document of the United States, the Articles of Confederation (February 5, 1778). 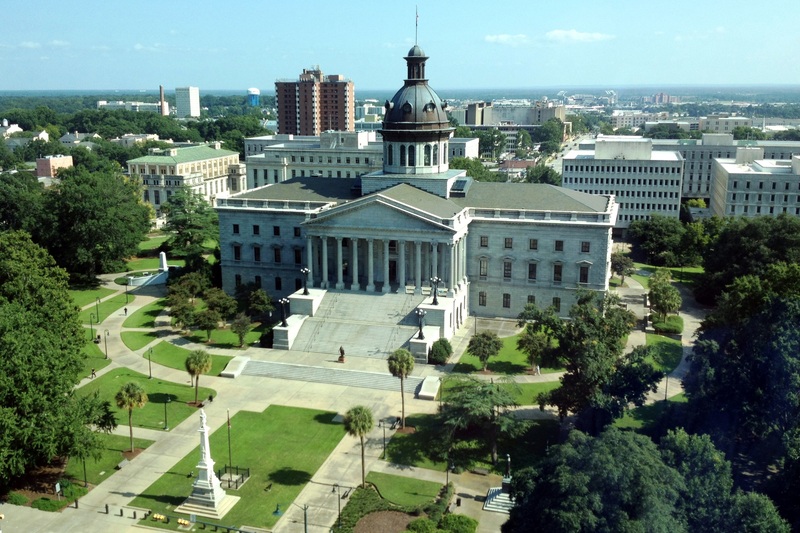 The South Carolina General Assembly, then meeting in Charleston, selected a site for a new capital in 1786. At the geographic center of the state and on the fall line of the Piedmont where the Saluda and Broad rivers join to form the Congaree, the location was a compromise between Up-Country and Low-Country farmers. Washington was one of the names suggested for the new city, but Columbia, proposed by state senator John Gervais, won by vote. Columbia was one of the first planned cities, with streets 150 feet wide laid out in a checkerboard pattern. The state legislature first met there in 1790, on completion of the State House. In 1854 construction of a new, fireproof State House was authorized, but it was 1903 before the current capitol was declared “complete” – due to a series of bad designs and a Civil War which left the state impoverished for years. Most buildings in Columbia were destroyed when Union General William Sherman came through in February 1865. The current capitol was under construction at the time; brass markers now highlight places on the exterior walls that were struck by Civil War cannon fire. A number of churches were spared that day – First Baptist, First Presbyterian, Trinity Episcopal, and St Peter’s Catholic; beautiful steeples and historic markers tell their stories now. Columbia promotes itself today as a “famously hot” city, thanks to a warm humid climate and a large-scale list of things to do. Music, theater, museums, and sports, of course; the South Carolina State Museum is one of the largest in the south; the University of South Carolina’s Gamecocks stadium hosts SEC football with its 80, 250 seats; the University claims the largest collection of Scottish literature outside of Scotland and the largest Hemingway collection in the world. Palmetto trees and historic monuments line the wide streets, and grace the grounds of many sites and parks. Sesquicentennial State Park features a 30-acre lake and a two-story log house that dates back to the mid-18th century; Congaree National Park is an international biosphere reserve known for its giant hardwoods and towering pines; its floodplain forest includes one of the highest canopies in the world and some of the tallest trees in the eastern US. Nearby Fort Jackson, established in 1917, is the largest Initial Entry Center in the US Army, providing basic training to more than 45,000 soldiers annually. The broad wide easy-travel streets, the churches and the pleasantness, the palmettos and the pines and rolling hills, the angst that lingers still about the civil war, the young soldiers in uniform, new graduates, Ft Jackson trained. Mountains near: Blue Ridge. Sassafras Mountain in the northwest corner of the state is the highest point in South Carolina at 3,554 feet.